"I don't know what my future holds. But I can't go back." That's an awesome quote from Benedict Cumberbatch in Doctor Strange, one of Marvel's best & most visually-stunning films. Cumberbatch plays Dr. Stephen Strange, a New York neurosurgeon with a pristine track record & an inflated ego. One night, he gets in a car accident, causing him to lose the use of his hands. Although his friend/ex-lover Christine Palmer (played by Rachel McAdams) tries to help him move on, Strange tries to pursue experimental surgeries, all to no avail. After learning of Jonathan Pangborn (played by Benjamin Bratt), a paraplegic who was suddenly healed, Strange visits Pangborn, & is sent to Kamar-Taj, a place in Kathmandu, Nepal. When Strange arrives there, he is taken in by a sorcerer, Mordo (played by Chiwetel Ejiofor), & is introduced to The Ancient One (played by Tilda Swinton), who teaches Strange of other dimensions. Strange begs her to teach him, to which The Ancient One agrees, despite his arrogance, reminding her of a failed former student of hers, Kaecilius (played by Mads Mikkelsen). 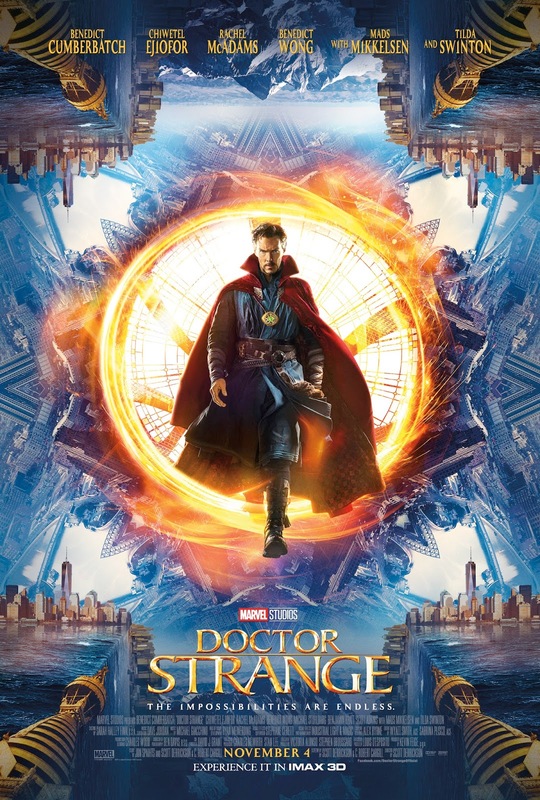 After learning, & eventually perfecting his sorcery, along with the help of master Wong (played by Benedict Wong), Kaecilius & his zealots summon the evil & powerful Dormammu, Strange must defeat them all & send them back into the Dark Dimension. The cast is excellent. The direction from Scott Derrickson is superb, along with the screenplay from Derrickson, Jon Spaihts & C. Robert Cargill. The visual effects are mind-blowing, with the effects similar to those of The Matrix & Inception, creating effects that are, for the lack of a better term, "trippy." And the soundtrack is amazing, especially the use of Chuck Mangione's 1977 jazz classic, Feels So Good. This is one of the best films in the Marvel Cinematic Universe.